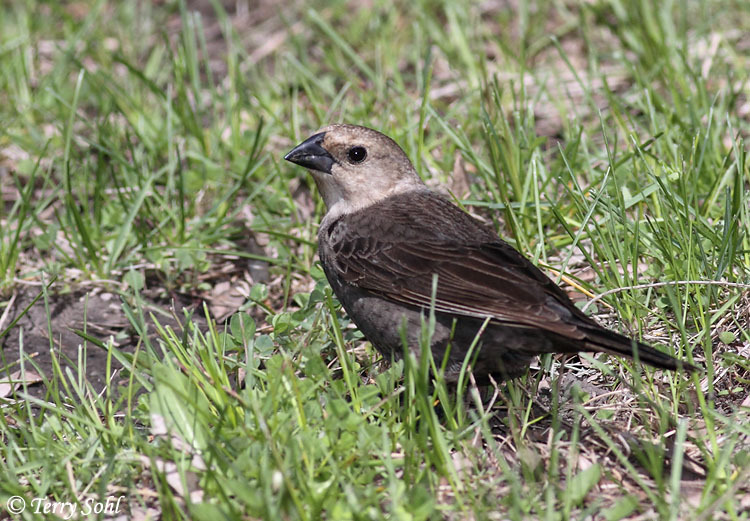 The Brown-headed Cowbird was originally a bird of the Great Plains, following herds of bison and feeding on the insects that were stirred up. It has undoubtedly benefited greatly from man's alteration of the landscape and introduction of grazing cattle in all parts of the country. 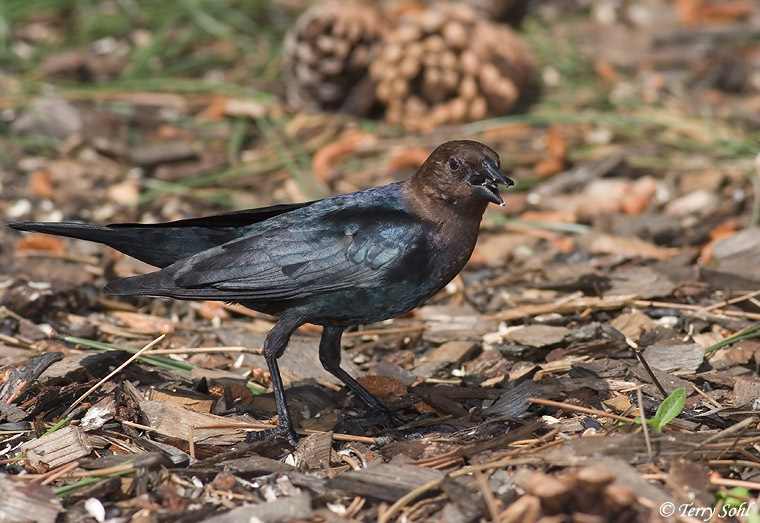 Cowbirds' claim to fame, however, is its characteristic brood parasitism. 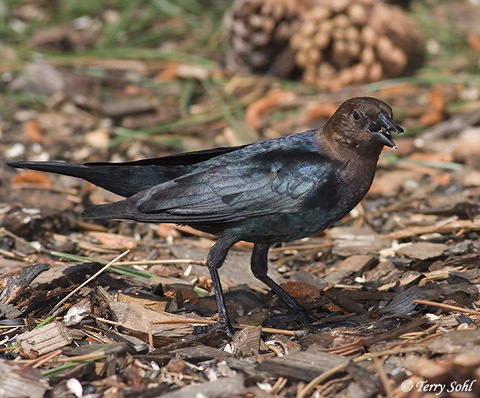 As with all cowbirds, it lays its eggs in the nests of other species, leaving the host species to raise its young. 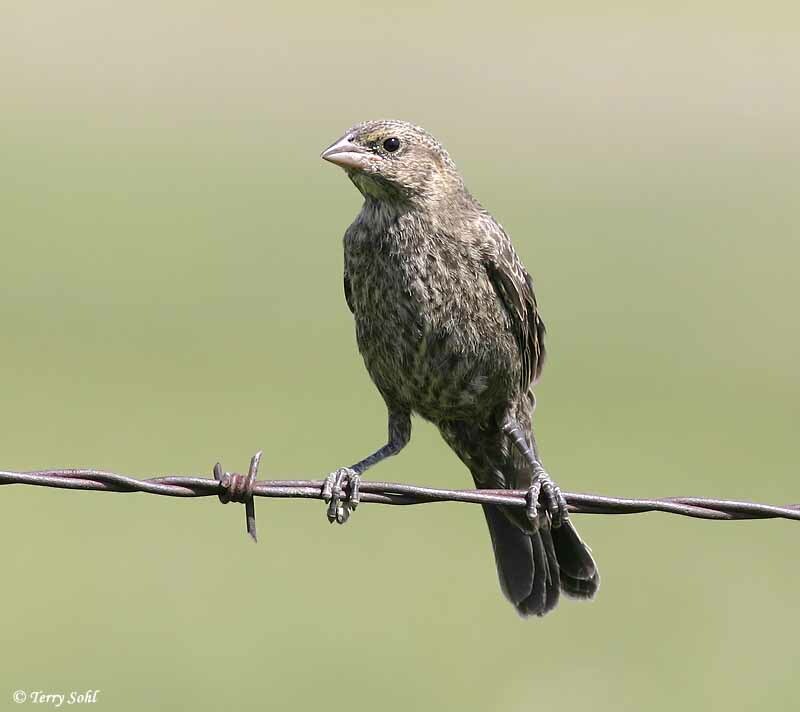 Over 125 different species have been known to unwittingly raise the young of Brown-headed Cowbirds. Many species, such as Kirtland's Warbler, are endangered or threatened, partially because of cowbird parasitism. A male is shown in the photo to the right. Habitat: Prefers open to semi-open habitats, including woodland edges, riparian areas, farms, prairies, and residential areas. Behavior: Primarily forages by walking along the ground. They also often associate with cattle, horses, or wild bison, following the large animals and picking off insects stirred up. They will also sometimes perch on the backs of these large mammals, and it is thought they may pick ticks and insects off of the animals' backs. Nesting: May through August. 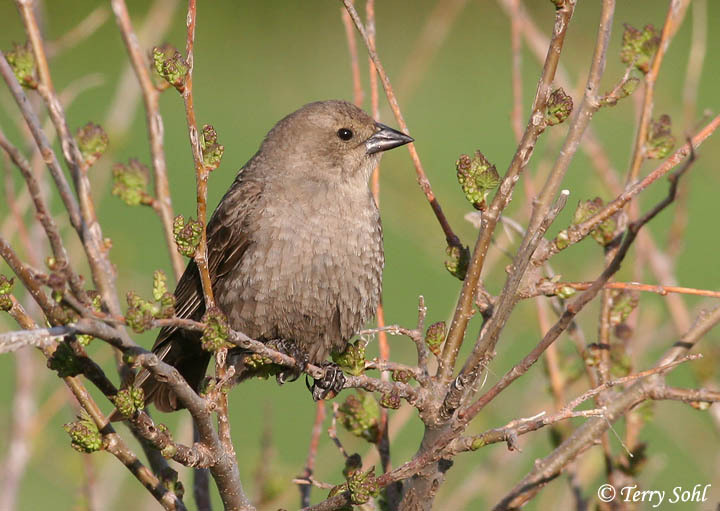 No nesting occurs, Brown-headed Cowbirds lay eggs in the nests of other bird species. One female can be a very prolific egg-layer, laying one egg per day in the nest of another bird for up to a month or more. Song: Series of low bubbly notes followed by thin whistling. Migration: Populations throughout most of the Northern U.S. and higher elevations of the West move southward in the fall. Similar Species: In South Dakota, adult male distinctive, with obvious brown head. At a distance could possibly be confused with Brewer's Blackbird. 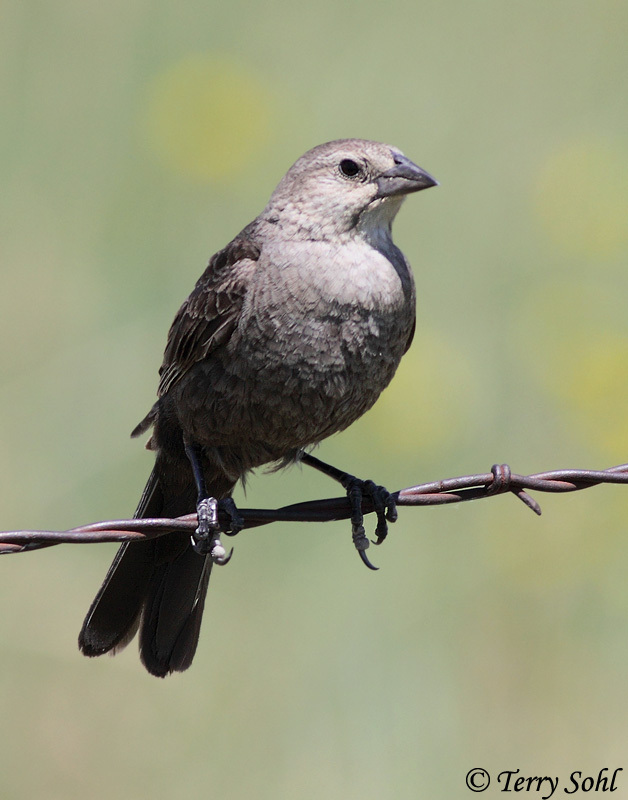 Also similar to other cowbird species not found in South Dakota, including Shiny Cowbird and Bronzed Cowbird. Conservation Status: Much more widespread and abundant than before man's alteration of the landscape and introduction of grazing cattle. 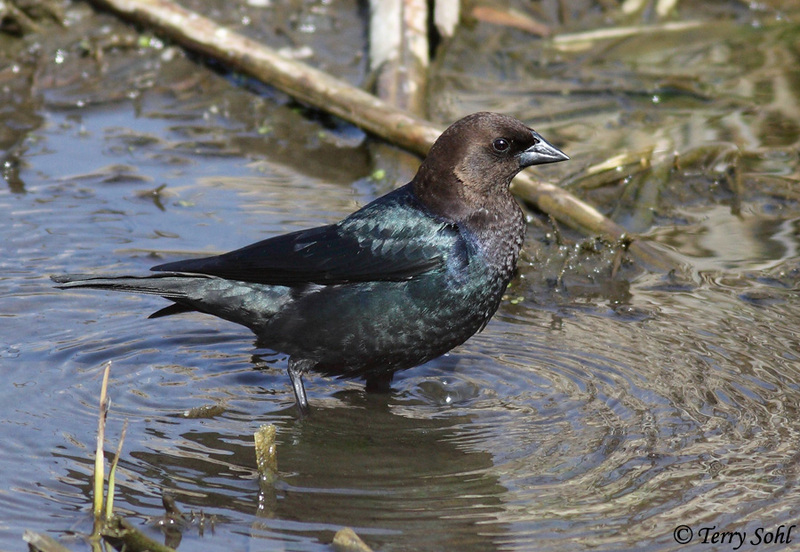 The IUCN lists the Brown-headed Cowbird as a species of "Least Concern". 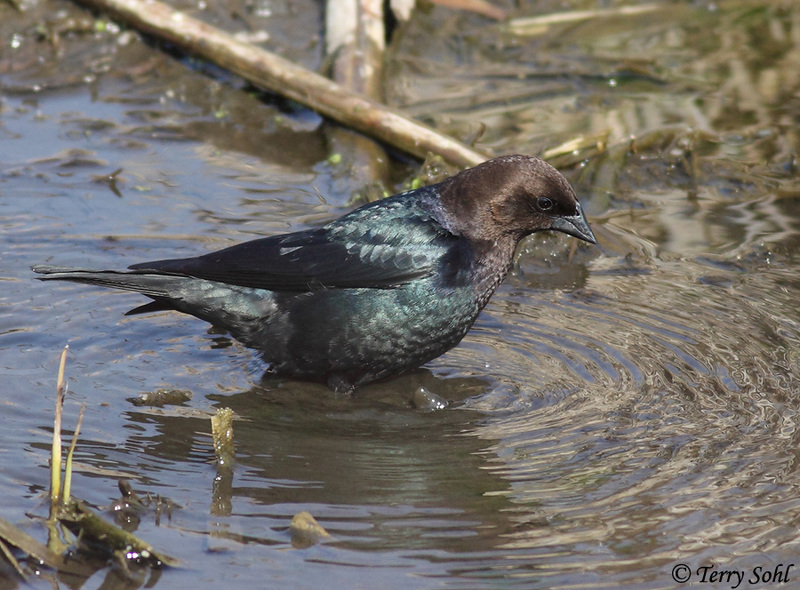 Additional Photos: Click on the image chips or text links below for additional, higher-resolution Brown-headed Cowbird photos.